Raw Ideas was asked by BEcause Australia to help deliver ‘A Taste of Home’ to the Australian Olympic Team heading to Rio to compete in the 2016 Games. Leveraging the coverage of the Woolworths stores across Australia enabled true home town support in the lead up to the Games. Building an engaging application that would invite everybody across Australia, in all communities, to look through athletes’ bios, choose a tasty treat to send them from home, offer some encouraging words and then take a picture to share in the athletes’ journey to the Olympics. 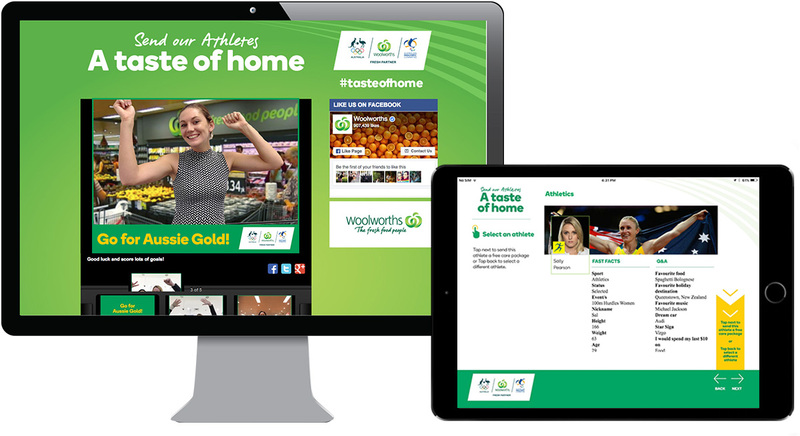 We deployed the Taste of Home iOS app via a virtual network to 380 iPads placed in Woolworths stores around the nation, driving branded user generated content and excitement in the lead up to the games. Customised reporting provided the ability to monitor the nationwide activation easily and ensure maximum results. Once the message and image passed through moderation, the image was emailed via Click2Share to promote social sharing. Need something built to reach all Australians?